Wonder Woman is a character deeply rooted in mythology and, as such, you'd think her enemies would all be minotaurs and monsters and what have you. But no, she gets things like Egg Fu, the gigantic moustachioed Communist egg, or Angle Man, the... man... who... loves angles? I don't know. Why isn't she tearing her way through the pantheon of debaucherous Greek gods? One of Diana's oldest enemies is a prime example of this terrible short-sightedness. 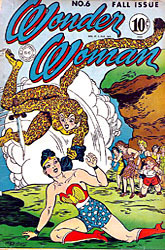 Issue #6 of WW's comic introduced Priscilla Rich, a wealthy socialite who literally went insane with jealously when her boss opted to go to a party with Wonder Woman rather than to supper with her, adopting the guise of the Cheetah. The feline-inspired nemesis of Wonder Woman, she dedicates herself to a life of crime. What that origin story tells us is that women are psychologically fragile beings who are ruled by their emotions, and as men, we should treat them like children in order to keep from upsetting them. And remember, Wonder Woman was the comic intended to make sure that young boys knew that women were fully capable and worthy of respect. In any case, Priscilla locked herself in her room in a snit. When she looked in the mirror, she saw herself dressed as a cheetah. Taking the cheetah skin rug from her floor, she fashioned herself a costume and set out on a life of crime. There have been several Cheetahs over the years, but only the first had this costume - the rest had exposed hair, and the most recent was a human/cat hybrid empowered by an African plant god. Priscilla just died in the comics, so it's fortuitous timing that we've gotten a figure honoring her. The fact that her outfit used to be a rug helps explain the semi-"Tortured Souls" look the figure has going on. The suit is stitched up the front, with more large stitches on the upper thighs and biceps. The design works, and is much more threatening than the kitty pajamas it always looked like she was wearing in the comics. 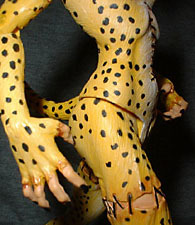 Tim Bruckner did all the sculpting for this series, and he made Cheetah look excellent. Every inch of her is covered with little lines to suggest fur, but the skin still pulls and wrinkles just as it should. You can tell that this is a woman in a cat suit, not a humanoid feline. The paint on the production version, inexplicably, is better than what we saw on the prototype. Originally the edges of the Cheetah outfit were bright red, like she'd just skinned the animal and thrown the skin on - the color has been toned down now, so while it still looks a bit like blood, it's no longer dripping and raw. The Cheetah is mostly yellow, with a great white wash running down her chest and the insides of her legs. Her dark black spots cover most of her body (there's a gap on her right hip that looks like a paint error) and the cheetah head is great. Particularly good is the paint on Cheetah's eyes - they make Priscilla look truly unhinged. Cheetah moves at the neck, shoulders, elbows, hips and knees - completely average for a DC Direct figure, but much better than their last Alex Ross figures. Her tail is a separate piece that plugs into the figure, so there's a point of articulation there, as well. Cheetah would never be able to stand on her own: her pose has her leaning drastically forward, so it's a good thing that all the Alex Ross Justice League figures come with a display base. The base doesn't specifically relate to the JLA in any way, but it does a good job of playing up the line's artistic origins. This line is ostensibly Alex Ross's version of the Justice League, a quick look at the line-up suggests that's it really more his version of the Superfriends - out of all the figures that have been unveiled so far, only two weren't on that show. Nothing wrong with updating the classics, Alex, but come on: don't be afraid to admit you love drawing cheesy old cartoon characters.